This stunning dress will truly not disappoint. It has beautiful gem stones and delicate beading throughout bodice and lace patterns all over with a long and show stopping train. I am usually a size AUS 8/10 up top and 11/12 down bottom. I only had a minor alteration made under the arm to bring in the top section. I am 179cm and wore 10cm heels as I didn’t want to take the bottom of the dress up. 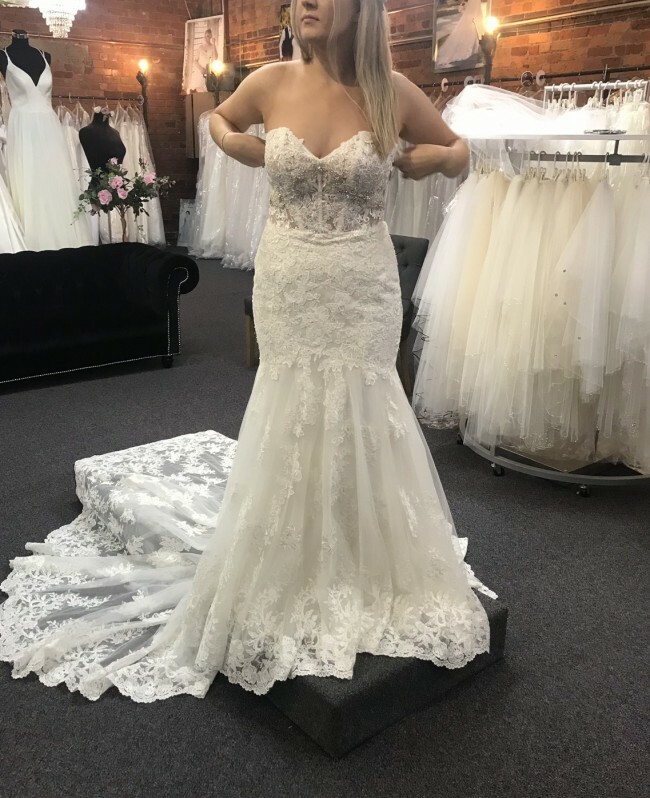 I purchased this dress for $2900 AUS in a Melbourne boutique and alterations were approx $200. I have just had it professionally dry cleaned for $370 also so this dress is ready for its new adventure. I had the underarm area taken in slightly to bring in the sweetheart cut.